Property owners in Edmond, Oklahoma and surrounding areas often look for ways to engage in preventative property maintenance. They realize the value of investing a small amount of money now, in order to save a tremendous amount of money on costly repairs in the future. If you own a residential, commercial, or industrial property it is never too late to start a yearly maintenance program. A good area to begin with is the plumbing system, particularly the drains and drainpipes. It is extremely important to keep them free and clear of debris buildup that is caused by everyday use. There are many items that go down the drain on a daily basis that are unhealthy for the system. For example, soap and shampoo in the shower or tub drain build up over time and causes clogs in the drainpipes. Grease, and food particles tend to clog the kitchen sink drainpipes. Hair, soap, and shaving cream lead to problems with the bathroom sink drains. Occasionally a foreign object such as jewelry, toys, and a host of other items fall into the drain by accident. No matter the cause, clogs in the drainpipes are tremendously annoying and can lead to more severe problems in the future. Hydro Jetting is a technologically advanced professional drain cleaning process that we are proud to offer to our customers. It incorporates the use of pressurized water to clean the interior surfaces of the drainpipes by removing the build up of scales and other debris that clings to the walls of the pipes. A highly trained and experienced plumbing technician will insert the hydro jetting hose into the drainpipes through an access point such as a drain cleanout. They will then pressurize the water to the proper amount of pounds PSI based on the condition of the pipes and materials that they are made of. This crucial, as if the PSI is set too high then the water will damage or even break the drainpipes. If the PSI is set too low it will not effectively clean the drainpipes. The technician must determine the exact amount of water pressure to use for each individual application. As the water is sprayed into the drain pipeline it washes away any buildup and effectively removes any clogs. 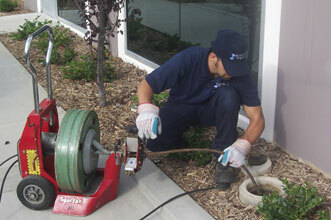 In addition to water, hydro jetting depends on gravity. The debris flows down the drainpipes and enters into the sewer pipeline where it is permanently disposed of. Hydro jetting is a safe and effective method of removing blockages and debris that clog drains and cause long term problems to the plumbing system. Please contact Nu Flow Technologies at your earliest convenience in order to set up a drain cleaning maintenance program. We can certainly book the appointments around your busy schedule. Our team of dedicated technicians looks forward to working with you, and helping to properly maintain your property.